Sweet, sweet Orange Challah Bread I love you. This mildly sweet, eggy bread is simply delicious. It’s a fairly simple recipe that even beginners can conquer. Enjoy the loaves of bread as french toast, bread pudding or simply dipped in rich hot chocolate. 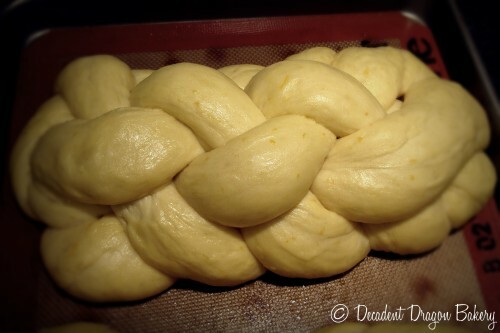 What I love about this recipe is that the challah is sweeter and moist. It’s better than the stuff you get at Draeger’s. My good friend has been pushing me to make and sell challah professionally. He curses the lack of specialty challah in the Bay Area. Not sure if I’ll be turning pro but this bread is certainly becoming a staple in my kitchen! Quick history: Challah is a loaf of yeast-risen egg bread traditionally eaten by Jews on Shabbat, ceremonial occasions and festival holidays. I use Smitten Kitchen’s Challah Recipe as a base but adapted it to my palate. 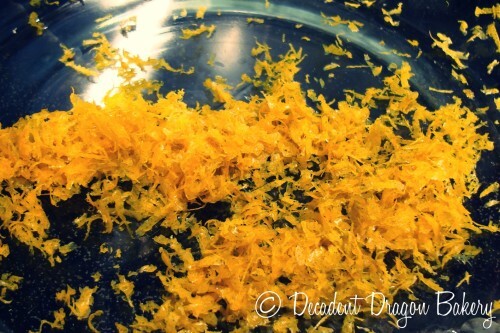 I LOVE orange bread – love it! So that’s what I made. 1. Zest oranges and place the zest into a large bowl. 2. Juice oranges (you should get about 1 cup of juice). Add enough water to the orange juice to make 1 & 3/4 cups total. Microwave mixture for 1 minute until lukewarm. 3. Add the yeast, salt and 1 tbsp sugar to the bowl of zest. Pour in the orange juice mixture and stir until combined. 4. Whisk in oil, remaining 3/4 cup sugar and the 4 eggs. Beat until mixed. 5. Slowly add 7.5 cups of flour. Mix thoroughly. Add more flour as needed. Once bread holds together and stops sticking to the bowl, you can stop adding flour. 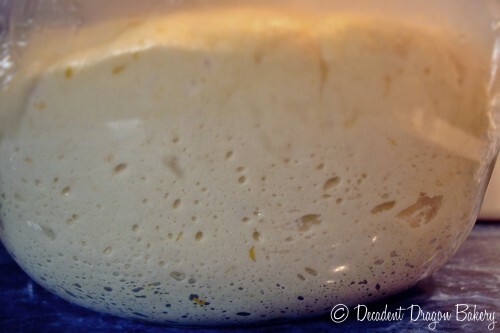 Turn the dough out onto a clean, floured surface for kneading. A pastry scraper REALLY helps with this process. Knead dough until smooth. 6. Clean out your large bowl and grease it with butter (shortening or margarine works if you’re making it non-dairy). Return the dough to the bowl and turn it once to grease it. Cover with plastic wrap and let it rise in a warm place for 1 hour. 7. After 1 hour, punch down dough and let it rise for another 30 minutes. 8. 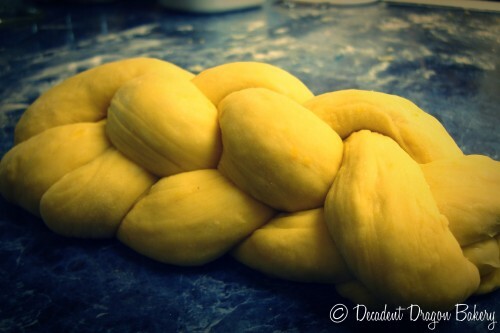 Once risen, it’s time to form the challah dough. For cutting and braiding instructions, follow this video below or Smitten Kitchen’s instructions. If you’ve ever braided hair, you’ll remember that it’s important to braid tightly for best results. 9. Once the loaves are braided, place them on a greased baking sheet. Beat remaining egg and brush it over the loaves. 10. Pre-heat oven to 375 F. Let the loaves rise 1 hour. 11. Bake in the center rack of oven for 25-30 minutes until golden brown. If the loaves are getting too dark, be sure to cover them with tin foil. 12. Remove loaves from oven and cool on a wire rack. Congrats! You should now have two gorgeous loaves of bread. Wondering what to do with all that bread? You can turn it in to Orange Challah French Toast [like I did Friday] or Orange Challah Bread Pudding [in the oven as I write this!]. Are you a challah-fanatic? Tell me what type of challah you’ve made in the comments. 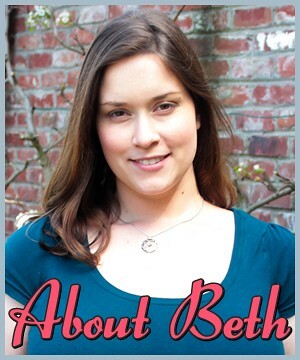 Looks great, Beth! 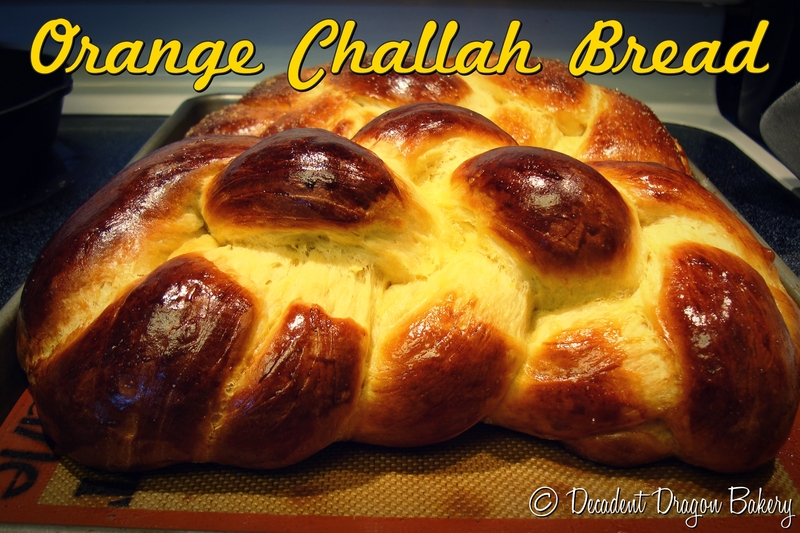 I never really liked challah before this, but the awesome orange flavor dipped in hot chocolate was spectacular! I just had an idea: you could use this recipe to make mini-challah breadsticks (maybe a three-strand braid?) that are the perfect size for dipping in drinking chocolate. The challah bread looks beautiful! I love the shine. Hmmm, either way sounds sooo tasty! Thanks for the visuals. It’s lovely looking bread. We’ll have to make some soon. I’m having issues getting the dough to rise, even though i proofed my yeast beforehand. I also noticed that this recipe includes no salt…shocking! Hi Laura – I’m surprised, my dough has always risen just fine. Very strange indeed. Did it end up working for you in the end? This recipe actually does include salt (and a LOT of it), I just screwed up and didn’t put it in the description. It’s fixed now. I’m curious to find out how it worked for you, so please keep me posted!